Slice of Life and Lessons from the Gas. I partly grew up five minutes away from this neighbourhood. 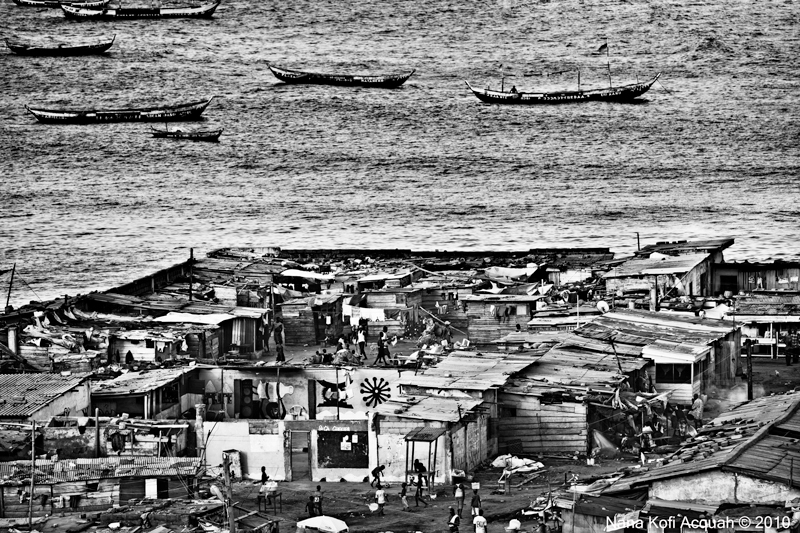 My memories are of fights, narrow escapes, street soccer, bullying, boxing, choked gutters and a foul mouthed Korle Lagoon. Fortunately, that is not where it ends. The Gas (the indigenes of Accra) didn’t necessarily give me my balls (I got those from Elmina) but they sure did affirm them. In this post I will quickly share with you, three things I learnt from the Gas. First lesson is: Say It Like It Is. There never was a people more blunt than the Gas of Accra. The Gas claim both Jewish and Nigerian origins. I can substantiate neither but what I know for a fact is, if a Ga man or woman has anything to say, they say it as it is. During the colonial days, the Gas gave the British so much grief, they decided in return to call them, especially the ones from La, "the bad ones". That is why the people of Labadi now insist they call them La and not Labadi. They are not bad. They are just outspoken. In a country plagued with nepotism, tribal discrimination and corruption, we cannot ask for more outspoken citizens. Secondly, Don’t Just Exist. Live to the max!!! I remember playing tour guide for my Kenyan friend and former colleague Josephine. I took her to James Town and she asked me: “Why are the people in red and black and also blocked the street”? When I told her they were having a funeral, her jaw dropped. She was amazed at how all these overweight women and pot-bellied men, wielding bottles of Star, Club and Guinness and dancing profusely to loud Highlife music in the middle of the street can say they are having a funeral. When you are Ga, you learn quickly that life is about laughter and fun not hard work and stress. Give a Ga man ten Ghana cedis and you will be surprised how much ENJOYMENT can be squeezed out of that one green note. Finally, Don’t be afraid to fight. I have adult friends who have never fought in their lives. I can’t imagine how that’s possible. You mean you’ve never kicked or slapped or punched somebody in the face till they bled? Never? Let me tell you how early a typical Ga child learns to fight. Recently, Nyani and I found ourselves in his fixer’s house at Bukom. Whilst they discussed model releases, my bored eyes strayed to two kids fighting. Neither of them was more than 2 years old. I was just about to go separate them when I heard a woman’s voice. She was saying “Bite him. Kick him. Yes. Bite Him. Teach him a lesson”. I paused and laughed and got shot straight down memory lane. When kids fight in typical Ga communities, nobody separates them. Adults sometimes form a circle around them and act as coaches. I don’t know if they still do it but in our days, the final advise your coach gave you if you managed to floor your opponent, was to fill their mouth with sand. Eating sand was the ultimate humiliation. Too many adults today are wimps. They don’t like their jobs, community, friends, weight, salaries; some even don’t like themselves but all they do is sit and grumble and blame government. Life is the beast we all must tame. Go out and fight that battle. Have a great a day and remember the Gas.